This elegant, elliptically shaped Classic Purse Nantucket Basket, traditionally and finely hand-crafted with hardwood base and top plate (available in Cherry or Walnut), features hand-beveled and tapered cane staves, meticulously placed close together leaving only a whisper of space between the staves to allow for the cane weaver to pass through. Originally called a covered basket, a Friendship basket, but now known as a Lightship Purse or a Nantucket handbag, these elegant Nantucket Basket Purses were designed and made popular by Mr. Jose Reyes in 1948. Since then, this style of Nantucket Lightship basketry has been widely recognized as the supreme work of a skilled Nantucket basket weaver. The body and lid of the Classic Nantucket Basket Purse is woven with fine Nantucket-grade cane weaving, very compact, giving the Nantucket Basket Purse the ability to essentially hold liquids - a hallmark of my basketweaving skills. I use only beautifully carved white oak for the basket purse handle, as it has both inherent strength and beauty, which will compliment your Classic Nantucket Purse. The handle will be attached to the purse with lathe-turned bone or ivory knobs and washers and a brass handle pin. A bone or ivory carving (scallop shell or whale) will be securely attached to the basket lid. The carved purse latch peg will be bone or ivory to compliment the material of the knobs and lid carving. The Nantucket basket hinges are traditional cane-wrapped leather, nailed through the rims for strength and durability, as are the front cane-wrapped leather closure loops. 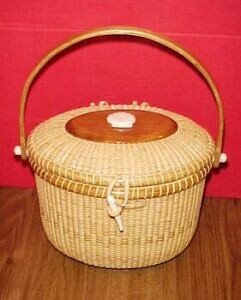 My full-size Nantucket Basket Purse measures 10" long x 7" wide x 8" high at the basket rims and 12" high measured at the top of basket handle. Base of the Nantucket Basket Purse will be signed/dated. Although I am no longer accepting orders for the Classic Nantucket Purse Basket, I do craft one or two of these per year. When its ready for sale, you can purchase it directly from my Simply Baskets website.